The Massage Balls by Cando. 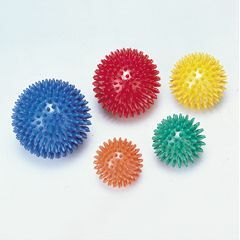 These spiky little balls feel great when rolled over tense areas. Massage balls are used to help achieve muscle and tension release for all parts of the body. The bumpy textured surface also promotes sensory stimulation and is perfect for manual dexterity exercises. Colors may vary. soft spikes provides. excellent pressure when. usingitto massage..
arrived uninflated. not noted in product . description. Recommended by physical therapist,and she was right! These are sturdy massage balls, with a good level of firmness. I use them in the Pilates studio, and often give them as client gifts. I'm looking for an 8" (20cm) knobby ball, also called a Reflex or Shiatsu ball. Do you sell that size?